One of my absolute favorite dishes to make is buffalo tofu, but I have a tendency to just make the tofu, dip it in ranch, end up eating the ENTIRE batch, and neglect any and all vegetables because the tofu is SO GOOD. So, I decided to reexamine this dish today, and try to make it a bit healthier and work some veggies in! Although compared to buffalo chicken wings, it’s already much better :). So all my omnivore friends who love buffalo wings but are trying to eat healthier will love this dish! For the salad: Cook peas and corn as directed on package in the microwave (I used frozen for quickness). Set aside to cool. Drain and rinse garbanzo beans…place in bowl and microwave for 1 minute. Set aside to cool. Meanwhile rinse the lettuce and chop the desired amount for your salad into small, bite-sized pieces, not the ginormous pieces you get at restaurants that could sink a boat (iceberg…get it? Too soon? Probably). Anyway, chop the roma tomatoes into pieces that are roughly the same size as the garbanzo beans. 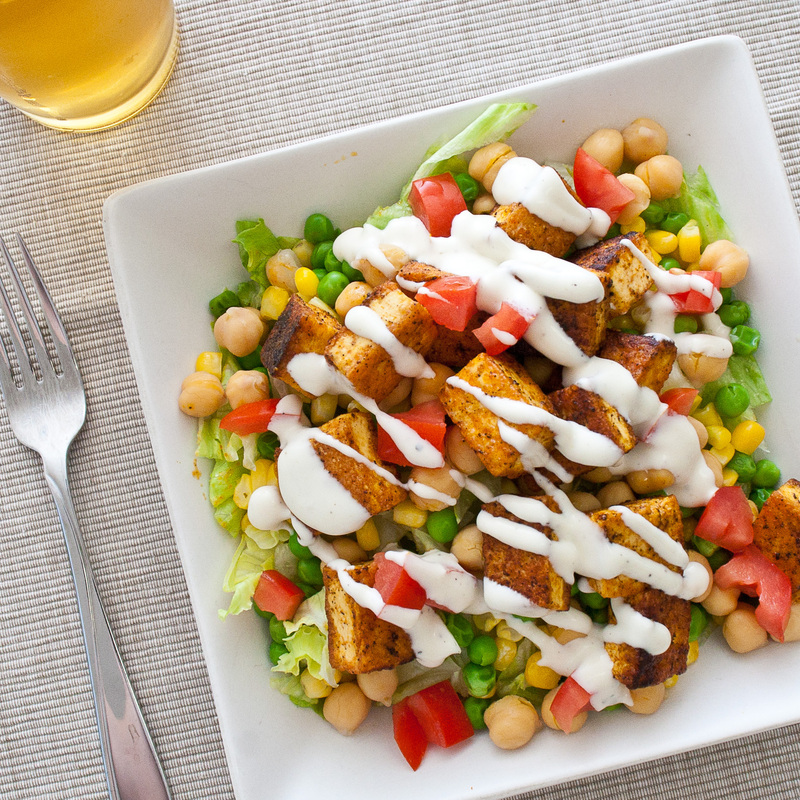 Once all ingredients are cool, toss together all salad ingredients in a bowl and set aside. For the tofu: Heat canola oil over medium-high heat in a wok or skillet. Meanwhile, cut pressed/drained tofu into about 1 inch cubes. Sprinkle cubes evenly with garlic powder, paprika, salt & pepper. Add buffalo sauce to tofu and lower heat. Stir until tofu is evenly coated & sauce is hot. 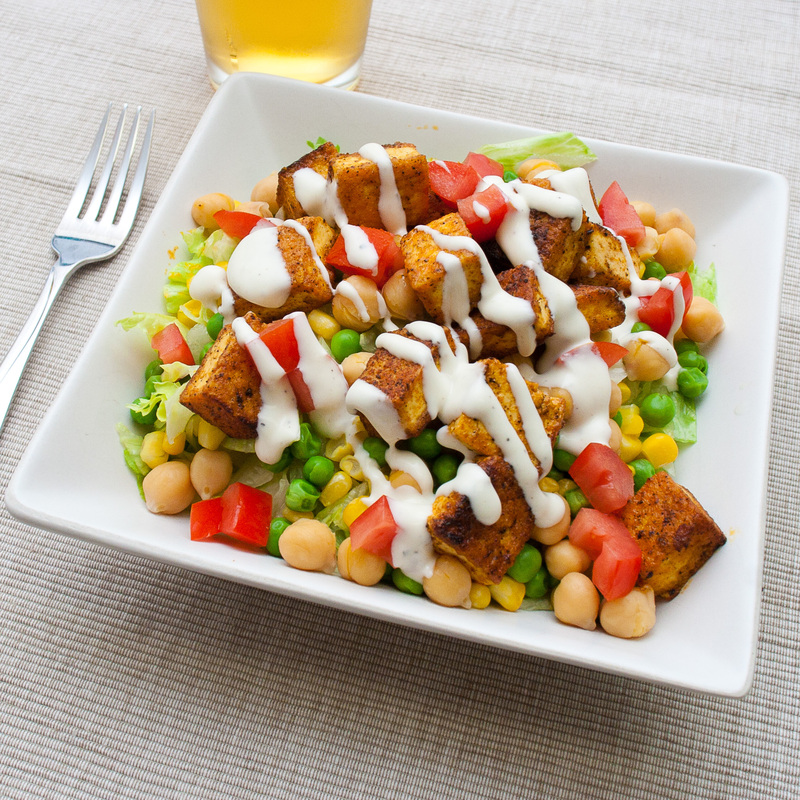 Toss the finished tofu with your salad mixture, drizzle desired amount of ranch over the top, and enjoy! I recommend enjoying with an ice cold gluten-free (or regular) beer or hard cider….because it’s summer and we’re grown-ups, darn it! Is this recipe to serve one, or more? Seriously?? SHUT. UP. This looks so good!! Pinning – now!